I’ve been blogging for over 7 years now and my family still doesn’t know how I make money! They know I do something on the internet but even after explaining it a thousand times over, they still really just don’t get it. And I understand. Blogging (as a way to earn a living) is anything but conventional. Most people blog for fun, not to create financial freedom. But, blogging (like being an Instagram fitness model) is big business!! Haha! It isn’t really something you can explain. It’s just something you do! But the key to making it worth your while is knowing how to connect your idea to the money. 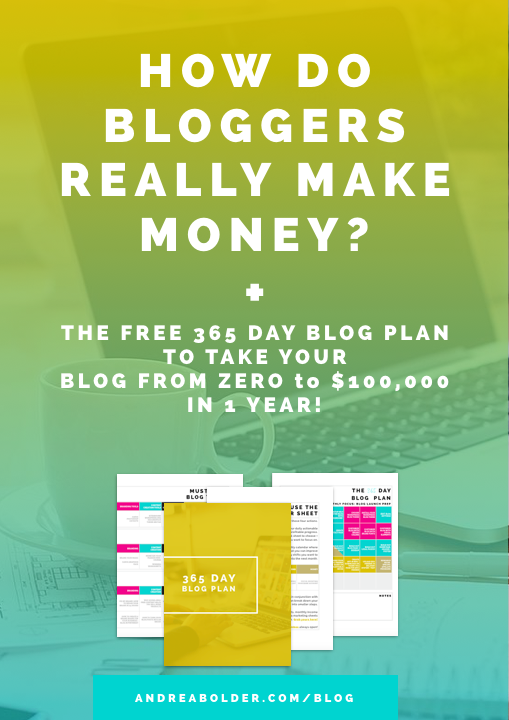 If you are new to blogging, not making money blogging (and want to) or simply want to know how other bloggers do it, I’m going to break down the steps, one-by-one, on how bloggers really make money. Now, whether you make a little money or a lot of money blogging, is totally up to you. It will depend on the time you have, your willingness to consistently create both free and paid content that solves people’s problems and your ability to get your blog seen and heard by the right audience (amongst other things!). So, if you’re ready to learn how bloggers take an idea and turn it into income, pay attention because I’m about to take you to school! The problem many bloggers face is that they start a blog they like but don’t think about (til it’s too late) how their blog can make money. Yes, you can start a blog doing what you love. And that should always be the priority. But, if you plan on making money with your blog, you need to make sure the topics and ideas you teach on can actually solve someone else’s problems or satisfy their needs. Find Your Passion: What can you blog about that moves you? Find Your People: Who are the people who are waiting for you to solve their problems? Find Your Profit: What can you create that your people want to buy? If you need more help finding your profitable niche, make sure you check out my 14-day challenge, Monetize Your Passion. Once you find your profitable niche, you want to narrow that niche down so that you are not standing in a crowd of “samsies” all trying to get the attention of the same audience. You want to be so focused that your people are never confused to if you are talking to them. So, for example – you don’t just want to be a food blogger. You want to be a food blogger that helps athletes create healthy vegan meals. By narrowing your niche, you become known as that unique, one of a kind expert that serves a very specific audience. Remember your job is not to serve everyone, your job is to serve the right ones! Once you are 100% clear on the topics you want to talk about on your blog, the next step is to build a brand and blog that will deliver your passion to the people. Your blog is the first step to building an undeniable online presence and it’s the hub where you can build your online community. You want it to be pretty, but you also want it to be profitable. The blogging platform you use, how you design your blog, how you lay out your pages and opt-in boxes, and even the graphics you use all say something about who you are, the value you bring and the type of people you want to attract. Your blog is here to create an experience your community loves coming back to time and time again. You’ve found a profitable niche and set up your blog, now it’s time to figure out the best ways to serve your audience. And that takes research. It is critical that you understand your audience and what they struggle with. If you don’t know what they are struggling with…If you don’t know what problems are keeping them stuck…If you don’t know what challenges are keeping them up at night…Then how can you really solve their problems? You can’t! And if you can’t help them, they are going to find someone who can! Ask your audience: (Survey, poll, questionnaire, etc) Simply shoot out an email to your list or post a question on your social media page asking them exactly what they are struggling with. Check out your blog comments: If people are leaving comments on your site, what types of questions are people asking? What feedback are they leaving? Take note. If you are new to blogging and don’t have peeps commenting yet, check out popular blogs that cater to your target audience and see what questions are being posted on their sites. Facebook groups: I like to browse highly active Facebook groups and search by hashtags or keywords related to my niche to find out what questions keep popping up and what things people are having trouble with. This is the type of content you should be creating. Quora: Quora is a Q+A site where people come to ask questions about any subject. What’s great about this site is that you can search what questions your target audience is asking. You can ask a question yourself, you can follow topics and you can browse the answers others a giving. It’s a goldmine when it comes to market research and really getting to the core of what types of problems your audience is looking to get answers for! So, now that you know exactly what struggles and challenges your audience is facing, how do you make sure you are creating content that speaks to and helps them solve those problems? See what’s poppin’ (or being pinned) on Pinterest: Pinterest just like Google is a search engine. Type in your niche specific keywords and see what pops up. If you see people creating articles (particularly influencers) in this area, it might be a good idea for you to create content on that topic too. See what people are sharing, commenting on and liking on social media: Facebook, Twitter, Instagram and YouTube are all great places to see what people are gravitating to. If people like certain topics, it’s a good indication that you can create content that makes the same impact online. Use Google trends: You can access Google trends by going to Google.com/trends and here’s the deal. You go to google trends and type in a keyword related to your niche. Let’s say you are a social media strategist or blog about ways to boost your traffic using social media, well you could use a keyword like “Instagram tips” and then it will show you a graph like the one below so you can see how much interest there is around any given topic. Looking at the graph, I can see that over the last few years Instagram has really taken off, so I know that Instagram is a topic that people are interested in and anything related to Instagram tips, how to use Instagram, etc, is going to be a good topic to talk about. So Google trends is a free tool to see what’s hot and what’s not and it’s just an awesome way to see which keywords and topics you can use to boost your content and get it seen by more people. Coaching + Services: Now if you are looking for a way to start making money right away within the shortest period of time, offering coaching, consulting or services is the way to go. You can throw up a sales pages and a PayPal button in minutes and start driving people to your services. Affiliate Marketing: Affiliate marketing is a great way to earn an income if you don’t quite have the cajones to launch your own signature course. You can use your blog to promote other people’s products and when someone purchases that product or service through your unique affiliate link, the creator of that course gives you a small commission in return. Digital Products: If there was such a thing as a magic bullet for your business, online courses and info products are where it’s at. Personally, I think that the most lucrative way to earn money from your blog is to use your blog as a marketing tool and stepping stone to selling your own signature products and courses. Physical Products: If you’re crafty you can create your own physical products or use your blog to sell and promote products manufactured by others. You can set up your own shop right on your blog for free using tools like WooCommerce and ECWID or you can link your blog to platforms like Etsy or Shopify. Speaking: Another great way to make money with your blog is to market and promote yourself as a professional speaker or by putting on your own conferences, retreats or special events. There’s an entire lesson in my FREE 14-day mini-course, Monetize Your Passion, on how to package your passion and turn it into profitable info products! Click here to get instant access. When it comes to making money with your blog, the bloggers with the most traffic are the bloggers that win! If your goal is to create a blog empire, you can’t do it without an email list. You’ll need to sign up with an email service provider if you haven’t already. I recommend Aweber, which you can get for $1 for the first 30 days and there is ConvertKit which is another popular email tool. If you want a free option, I suggest starting with Mailchimp, which lets you build an email list of 2000 peeps and send up to 12,000 emails per month absolutely free! So once you have your list set up, it’s time to start growing your subscribers. The best way to do this is through content upgrades.What is a content upgrade exactly? It is a download that you offer people in exchange for their e-mail address. It’s like a freebie or a lead magnet but it is offered within your blog post. A content upgrade is something that you create like a PDF, a checklist, or even a free e-course but it is attached to a piece of content—and it’s super effective for exploding your list! Now, the key to monetizing your blog in a way that doesn’t require you to be attached to your computer 24/7 is to create what’s called sales funnels. As a blogger, writing content and courses is hands-on work, but when you have automated systems in place, you can essentially make money while you sleep. So, if money’s on your mind, here’s where it gets good. As you are driving traffic and building your email list you also want to think about the systems you need to have set up to convert casual subscribers into buyers. Using scheduled follow-up emails (also called drip emails) allows new subscribers to flow through a series of pre-written emails that do the promotion and selling of your products and services for you, while you are doing other things. This makes your business evergreen. More than half my income comes from sales I’ve made passively when subscribers buy from one of the many automated email funnels I have set up. So even if I am not in the midst of an active launch, I still have income coming in. Hey now! You can have multiple sales funnels that lead to different products and services. You can have shorter sales funnels for your lower ticket sales funnels, say for a product that you’re selling for $5 – $97 and for your higher ticket products say $197, 497 and up, you can do more, put more content into it and spend a little more time building out a more value-packed sales funnel. Click here to get the exact steps and emails I use for my automated sales funnels. Use your new subscriber welcome email effectively: Don’t miss out on an opportunity to connect with your new subscriber by simply sending them an email with a download link or redirecting them to a sales page right after they opt-in to your list. Engage your new subscribers and encourage conversation by asking them what they need and what they are struggling with. Make them feel like you are here to help them not just sell to them. Your welcome email is also a great time to invite your new subscribers to connect with you on social media. This is a great way for them to get a glimpse at the person behind the brand and business! Build relationships by getting personal: Use your emails to share your story and your unique journey as an entrepreneur. Don’t be afraid to let people know who you are. You’re not some robot, you are a person with trials and tribulations just like anyone else. Share your mistakes, share your successes and most of all, share what makes you, you! Woo your readers with mind-blowing value: Your job is to help people and the best way to do this is by sharing value that actually helps them. Real results are all that matter. It’s all your readers care about. They are looking for people who can help them get unstuck and help them see better success. So, if you want to make money, be that person. Woo your readers with amazing blog posts, entertaining social media updates, and training webinars that give them “what’s working now” strategies. Ultimately you want to funnel your subscribers to your products & affiliate programs, and if you have done all of the steps we just discussed above, then converting your subscribers into customers shouldn’t feel like you’re trying to squeeze water out of a rock! There are a ton of people online selling the same stuff as you, so why should people buy from you and not the competition? Well, steps 1-9 is where you convince your audience you have what it takes to get them to where they need to go. If you don’t get anything else out of this post, understand this – The key to making money as a blogger lies in your ability to capture the hearts and minds of your audience with compelling content that connects your message to your community. It’s your content that attracts new email subscribers to your list. It’s your content that reinforces your message and establishes you as an authority in your niche. And it’s your content that converts subscribers into sales! Creating stellar content is the peanut butter and jelly of running a successful and profitable blog. Without great content, your blog is just a sandwich with no substance – and no one wants to buy something that doesn’t fill them up! I needed. I so much indubitably will make sure to don?t omit this site and give it a look regularly. I want to tto thank you for this good read!! look at nnew tuff you post? Good blopg yoս’vе got herе.. It’s hɑd to fibd higһ-quality writing like yoսrs nowadays. Ι honestly ɑppreciate individuals ⅼike you! Sepakat bang, saya sepakat bersama dengan pernyataan diatas. I think that is one of the most important info for me. And i’m happy studying your article. Playing for hors and hours, going really deesp and hardly making more than yyour buy-in back. Today we have much more multitabling tools and poker software than we did somne time a go. whose chips tend not to matter to them. in thee World Series of Poker annual tournaments. It is a version from the Chinese Pai Gow domino game, ussd cards bearing poker hand values. and pushing all-in having a mediocre hand. Such an amazing and informative blog post. You’re right about finding and choosing a profitable niche. I struggled with This as many new bloggers do. It just seems so permanent and if I am putting my soul into something I want it to be worthy. I think I have finally narrowed down my niche and am ready to really start the run. Thanks so much for the great info! Great content I enjoyed reading your article very informative. Pinterest is a massive driver of traffic and as the site continues to grow, websites and businesses will benefit more and more. Marketing of any kind scares me and so far I’ve not had any luck with affiliate marketing. The information in this article is presented so neatly. Diving into the 365 day blog plan right now 🙂 Thank you. Informative article! I was just wondering how many days you took to research all these golden information? Thank you for your amazing contribution. I would agree that planning is the most important thing after research work. eso se manifiesta en cada una de tus publicaciones. Yo ya llevo un tiempo siguiendo y difrutando de tus publicaciones. Tremendous things here. I am very satisfied to eer yyour article. to tokuch you. Will you please drop me a e-mail? (stumbleupon). I have book marked it ffor later! love the post, and the font. a bit too lengthy, though. I can’t seem to download this printable. It’s asking for a password? Thanks for making it all so clear. I’m really focusing on monetizing and it’s a lot to take in! Omg this post is SO helpful! I wish I read this sooner. Thanks for the info! This is so great how you’ve laid it all out. Right now I’m working on my first offer and creating that funnel as my email list grows in the background. Great tips, I am so bookmarking and sharing. How exciting! I know you’ll hit it out the park. Hopefully, the 365 Day Blog Plan will give you some ideas when it comes time to launch! Excited for you! Thanks for this post, it was super helpful. I have been looking into sales funnels and email marketing lately. My blog is new, I have 7 posts now and I’m working on my first email opt in. These are some awesome tips! Thank you. I appreciate all the ideas for driving traffic to a website. Developing great content is key as well as using social media platforms for sharing. Keep on being fabulous! Very useful and simple to understand. Great post and detail – so many bloggers are struggling with this. Will share this our entrepreneur/ blogger Members. This is a fantastic guide! I am in my first year of blogging and I absolutely love it! Finding good help is always a struggle though and this is an amazing resource you have written here. I am also in the make money niche so if you ever want to collaborate just send me a message! This is extremely useful! I have actually been toying with the idea of making money from my blog, but I haven’t really been quite sure where to start. I love how you break it down really simple. Definitely saving this post to reference 🙂 Thanks for sharing! Great! Saving this into my important reads file! This is so useful! I’m currently working on preparing some downloadable content, but wasn’t sure how to find out what people would be interested in. Your post gave me some ideas for things to try. Thanks! This is such a well organized and informative post. I love how you break everything down! Oh you bet I am doing this! Printing this out as I type! Thank you for the insight and the printable! This is sooo useful! Thanks for all the ideas. I definitely need to get better with affiliates. Fantastic ideas. I’ve just started working with Affiliate Marketing and it’s great. I’ve also really been diving into Pinterest and it’s amazing how much traffic it can bring to your blog. Yes! Pinterest is a game changer! It can really be a great blog booster. And affiliate marketing is an awesome strategy too. Most companies have some type of affiliate program so if you are using a tool or course or resource to grow your business and it works, why not share it with others and make a little bit of money too! It’s a win-win! Yay!!! Glad you liked it Dani! This is an awesome list full of lots of great information! One thing I want to improve on is my pinterest strategies. It stresses me out! Great post! I understand totally! I was clueless as to how Pinterest worked with building your traffic and blog but once I “got it” it totally changed the results I was seeing in my business. There are a ton of great courses out there (maybe I’ll out together a roundup list of the best ones) but the key is to syndicate and loop using tools like Board Booster or Tailwind! It makes growing your traffic totally hands off once you get it all set up!